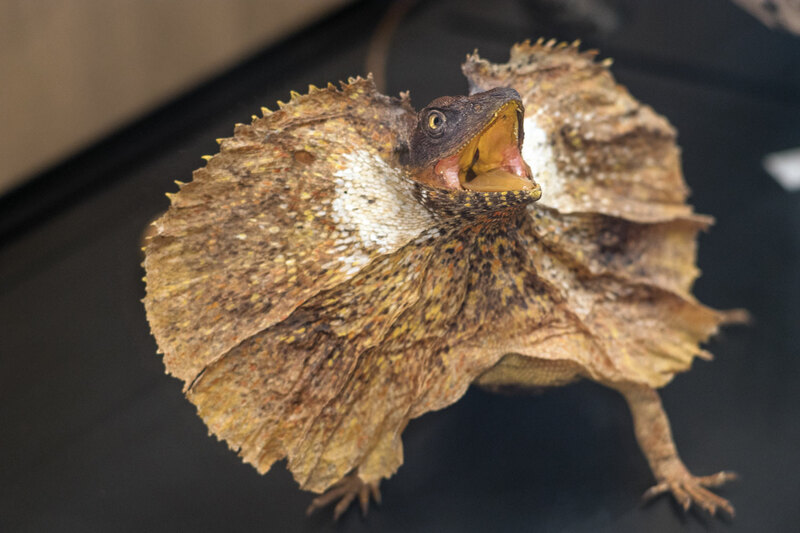 The Chlamydosaurus kingii Frilled-neck Lizard is one of Australia’s most spectacular dragon lizards. This large dragon inhabits tropical woodlands in northern and eastern Australia and New Guinea. Frilled-neck Lizards eat insects, and they hunt by perching 1 - 2 m above the ground on standing tree trunks to ambush passing prey. Their rough texture and mottled colouration makes them extremely well camouflaged, and when approached they hide from view by sliding around to the opposite side of the tree trunk. If detected on the ground, Frilled-neck Lizards can run bipedally on their hindlimbs and quickly escape up a nearby tree. When threatened, they turn and face their attacker and suddenly erect their frill. The startling combination of a wide frill, a gaping mouth and loud hissing presents a very formidable defensive display!